Alpacas are native to the Andes where they have been domesticated for some 5,000 years. Unlike their close relations camels and llamas, alpaca are not used as pack animals. Rather, alpaca are known for their fleece and for their docility. Alpaca are gentle, calm, and make affectionate pets. They are social, herd animals - enjoy company - and communicate with soft humming sounds. They have a serene manner, yet they often seem to be torn between curiosity and shyness, with curiosity usually winning the inner struggle. These intelligent animals are easy to herd, can easily be trained to halter, and can be handled by anyone, even children. 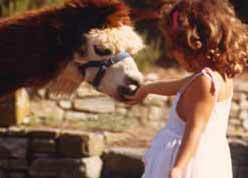 Female alpaca can start breeding at about 14 to 18 months of age; males, at about 3 years. The gestation period is 11 months, with rebreeding 2 to 3 weeks after delivery. 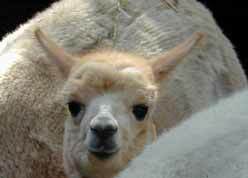 A baby - called a cria - usually weighs 7 to 8 kilos at birth. With a life-span of up to 20 years, alpaca grow to weigh up to 75 kilos. Adult alpaca are very hardy and use food very efficiently. Despite their being larger than sheep or goats, alpaca eat only about half as much, due to the efficiency of their digestive system. Therefore, alpaca are particularly suited for land that won't support other forms of agriculture. Their grazing area should be fenced and provided with an open shed, available for shelter and shade. Yet they need only minimal fencing because, unlike sheep, goats and horses, they are territorial and rarely abandon their established territory. Alpaca are sheared once a year, usually in the Spring before the heat of Summer begins to make them feel uncomfortable. The alpaca is first sheared at 12 months of age; this shearing produces the finest fiber - baby alpaca fleece. 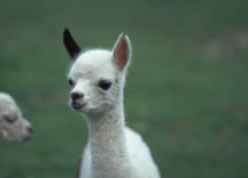 An adult alpaca produces 2.5 to 4 kg. of fiber each year. Since alpaca fleece is such an excellent insulator, cold winters don't bother them. Alpaca respect the ecosystem. Their cushioned hooves and soft tread does not harm grasses and delicate undergrowth. They keep fields and woodlands trimmed, thus helping to prevent fires. Since they share the same confined areas to defecate, fields are kept clear and the waste is easily gathered for use as organic fertilizer.